In 1985 Dr. Vaughan graduated with her BS in Cellular Biology from Northeastern State University in Tahlequah, Oklahoma. In 1986, she finished training for her EMT License at the Bill Willis Skill Center in Tahlequah, Oklahoma. In May of 1990 she received her Doctor of Optometry degree from Northeastern State University College of Optometry and opened her practice in West Siloam Springs. In 2003, she became certified in the therapeutic use of lasers to treat eye diseases and conditions affecting the anterior portion of the eye. Dr. Vaughan’s specialties include Dry Eye Surgical Management, Pediatrics Specialty Contact Lenses, and Disease Detection and Management. Dr. Vaughan is a member of the American Optometric Association, Oklahoma’s Association of Optometric Physicians and Fellowship of Christian Optometrists. She belongs to the Beta Sigma Kappa Honor Society. She is involved with the Siloam Springs Lions Club, and is a member of the Eastgate Church of Christ. In addition to seeing patients in her office in West Siloam Springs, she also cares for residents of the Stilwell and Quail Ridge Nursing Homes. 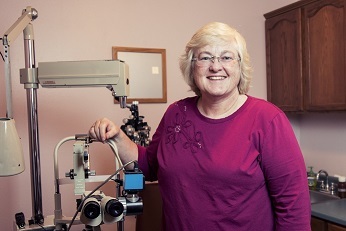 She is very involved with children’s vision issues and performs school screenings as well as occasionally working on a consultation basis with local schools and teachers. She is proud to be a participating physician in the Vision USA and InfantSee programs sponsored by the American Optometric Association. Dr. Vaughan resides in Siloam Springs with her daughter Madeleine and their dog Trixie. She graduated High School from Westville, OK having grown up around the US – the child of career navy father. Outside of work, Dr. Vaughan enjoys sports and reading.